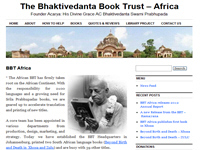 The website of the Bhakti Vedanta Book Trust’s Center in Africa – world’s second largest continent. It presents reviews about the various spiritual books, list of all books available, etc. You can also contact them for helping them with translations. Category Book Distribution, ISKCON Ministries December 9, 2012 by ISKCON Desire Tree. Category Art and Artists December 26, 2012 by ISKCON Desire Tree. The Blog of IYF Bhopal, which presents the photos of the various activities of this BACE and also provides all the relevant information. Category Blogs, ISKCON Outreach, Youth December 31, 2012 by ISKCON Desire Tree. This website contains the video lectures of His Holiness Bhakti Vikas Swami on the topic: “Purpose of life”. Category Sannyasis December 9, 2012 by ISKCON Desire Tree.